The circular bubble and horizontal circle are easily read as they sit next to the telescope and the external sight which allows for easy approximate targeting. The image is shown upright and the double sided endless drives provide fast targeting. 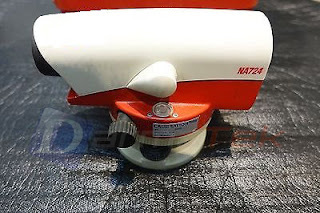 The NA724 comes with one of the finest optics allowing for short measuring distances, accurate aiming and measuring in adverse light conditions. The increased robustness and tough features of The NA724 include protections against water and dust. Tight seals and a gas filled telescope give protection against hazards should the instrument be dropped in to water for example.